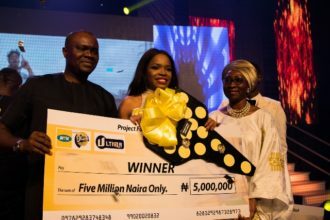 Report just reaching our news desk confirmed that the second runner-up at the 2012 edition of the MTN Project Fame West Africa show, Adetoun Adekoya, simply referred to as Adetoun, cheated death on Wednesday afternoon when her car was involved in a road mishap. Information gathered by us revealed that the talented singer was travelling in her Toyota Corolla, which she won at the competition, when the unfortunate incident occurred. Report said a heavy duty vehicle rammed into her car, which badly damaged it, but she managed to escape death. Adetoun was reportedly on her way to a church programme in Ilesha, Osun State.